Unless you know what is being said about you in the media, you cannot respond appropriately. Keep an ongoing check on your brand awareness and the opinions of your customers. Monitoring your competitors and checking facts, intentions and risks can secure you key competitive advantages. Analyse topics and trends with up-to-date technology for sentiment analysis, share-of-voice mapping, geo-coverage mapping and custom analysis and look at data through other eyes. A user-friendly platform enables you to navigate the flood of information quickly and easily. Modern search tools give you relevant and useful information in real time. ARE YOU INTERESTED IN TRIAL ACCESS? 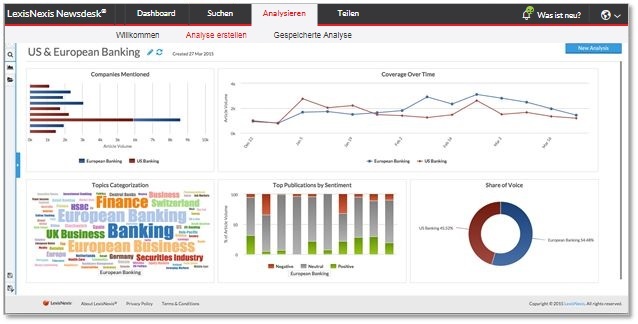 LexisNexis Newsdesk® is a multi-award-winning solution for media monitoring and analysis. In 2017 it again won the CODiE award for the best news media monitoring solution. With LexisNexis Newsdesk® it is quick and easy to search, analyse and share market information from the industry’s most comprehensive collection of news, radio and social media sources. The information updates instantly, enabling you to learn about the very latest issues even before the press can report on them. You can monitor the media and your market in real time and are therefore perfectly placed to respond promptly to changes. Whether you are checking out the competition, monitoring the tonality of reports about your company or looking for ideas for your content marketing, LexisNexis Newsdesk® gives you the answers you need to secure important advantages. Amid the ever-growing flood of information you can focus on relevant material so that you can make decisions quickly. Monitor how your brand is perceived in traditional and new media. Demonstrate the success of your marketing campaigns, identify opinion leaders and monitor announcements related to your crisis communication. Analyse the competition in detail, see how your competitors are perceived, pick up on trends and identify the strategies of other market players. Obtain a useful overview of the activities of current and potential business partners and draw up detailed profiles. Know where your market is heading. Track comments and opinions on new products or services. Identify positive or negative feedback immediately and respond accordingly. Track important news and events that could impact on your company and make fact-based decisions. Save time and resources with an automated media monitoring system and accurate search functions that deliver high-quality results. Newsdesk enables you to access more than 60,000 sources of national and international news and business information – in almost real time from over 100 countries and in 90 languages. Every day some 2.5 million articles are indexed, categorised and made available to you within just a few minutes. And every day more than three million relevant social media postings in blogs, videos, podcasts, forums and comments are selected and categorised. With the customisable distribution tools in LexisNexis Newsdesk® you can use an app in your corporate design to set up RSS- feeds, email alerts, newsletters and the newsreader for your company and your customers. Newsdesk can also be integrated into portals and CRM systems – you retain full editorial control. So you can be sure of always sharing the most relevant information whenever it is needed. 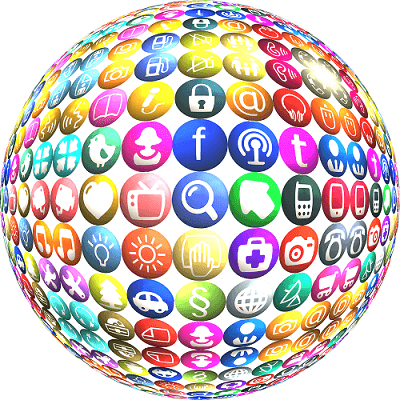 Keep up to date with the implications of online media for your risk management: the Influence Rating measures the influence of social media sources, especially blogs and forums. Simply Drag & Drop drop saved searches and charts to create customisable dashboards that enable you to monitor headlines and trends in almost real time. Then you will always be up to date with regard to information that is relevant to you. Dashboards can be shared with colleagues directly from the tool or on internal platforms. Search results can be depicted using a wide variety of charts. Thus you can analyse media reports (e.g. over time, share of voice or reporting by sources), entities (e.g. companies or products mentioned), influence (e.g. MozRank, Followers, Twitter Klout Score), place (e.g. country or region of publication), tonality or sources. It is easy to select the required charts and assign them to automated analyses via Drag & Drop Predefined templates make getting started easy and suggest the most appropriate charts for your purpose – such as market analysis, industry analysis or competition analysis. The charts are interactive and can be integrated into your internal portals, such as the Intranet. Simply click on the relevant area to display the saved article. The number of possible results may run into millions, but 37 different filter options enable users to find and display relevant information in seconds. For example, you can filter by date, tonality, popularity of the publication, type of publication, company, ticker, place, topic and so on. An info panel appears above each heading in the results, providing at-a-glance information about the article and the source. The info panel includes a tonality ranking, the publication country, keyword match (if keywords have been defined), MozRank (a rating of the website) and Klout score (a rating of the author’s influence). Email alerts inform you about the latest developments at times or intervals defined by you. The tonality analysis tells you whether the content of an article is generally positive, negative or neutral. The analysis, which uses Lexalytics, is available for English, German, French and Spanish content. Articles in the results list can be tagged to simplify future searches. Tags are automatically added to new matching articles. Users can add their own comments to articles via the Comment icon. You can set up the product interface in English, German, French, Spanish or Dutch, as required. LexisNexis Newsdesk® uses LexisNexis® SmartIndexing™ technology,making it even easier for you to manage the endless flow of information from news media, television, radio and social media, from both licensed sources and the open web. Data can be exported in XML for integration into third-party applications such as Eurospider.